Limited to 888 hand-numbered copies incl. DVD. 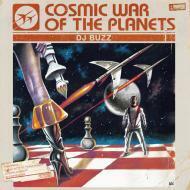 Edit of the 1978 science fiction movie "Cosmic War Of The Planets" soundtrack, DVD shows the edited movie. DJ Buzz also rebuild costumes and the scenery of the movie and uses it for live performances.